On this blog, I have mentioned on a few occasions that I am a musician. My primary instrument is the trumpet and I have been playing now for over 30 years. A running joke for many trumpet players is a line which goes something like "higher, faster, louder." A lot of trumpet players act like they want to be the next Maynard Ferguson, so they are always trying to outdo one another in playing higher and louder. You know, we as consumers here in the United States can kind of have a similar philosophy as far as how we spend our money. Instead of a "higher, faster, louder" mentality, though, we approach life with a need to purchase the "latest, fastest, biggest." We have a tendency to get into the mindset as consumers that we need to go out and buy the latest and greatest "thingy" that is available today, whether it be a television, car, computer, or cell phone. If the world says you need to go and buy the latest, fastest, and biggest, it would stand to reason that perhaps this may not be the best philosophy for the Christian. In Romans 12:2, the Apostle Paul encourages us to not conform to the pattern of this world, but be transformed by the renewing of your mind. Christ himself as well as the apostles modeled lives of simplicity for the early church. Their over-riding concern was to accomplish God's Kingdom work while living on earth, rather than accumulating a pile of worthless stuff in light of eternity. How can we individually and communally - in our homes, churches, camps, workplaces - resist the rushing current that is our materialistic culture and its siren song of success while cultivating and putting into practice a more faith-filled way of life? Here are... simple strategies: 1. Say no. Don't buy the latest, fastest, biggest. Live simply. 2. Tithe. Give a percentage of your income away - to your church, to Bread for the World, to Church World Service, to missionaries, to the local soup kitchen or homeless shelter (Source: Passing the Plate: Why American Christians Don't Give Away More Money by Smith, Emerson, and Snell). The call for simple living is not a punishment or even a commandment. There are practical reasons why we as believers should strive to keep our lives as free of the clutter of this life as possible. First, simple living frees up our income in order to be able to give more away. When we have margin in our family budget, we can give extravagantly and purposely to His church as well as to those in need. Becoming debt free is perhaps the best way to simplify your finances and give you that extra margin in your budget to live a life of generosity. Second, simple living helps us to live selflessly instead of selfishly. Instead of using the incomes God has blessed us with on selfish desires, we become outward focused. We become more concerned with the needs of others instead of our own needs or wants. Third, simple living keeps our focus on God's Kingdom instead of our temporary home here on earth. We really start living like aliens at a temporary address. Why should we be so concerned with piling up possessions here on earth for 70-80 years, when our real home is in heaven for all of eternity? Instead, we should be piling up treasure in heaven through investing our time, talent, and money into God's Kingdom work in our brief time here on planet earth. Are you living the simple life or are you still chasing after the "latest, fastest, biggest?" What do you need to do in order to move away from the world's philosophy to God's philosophy? Thanks for the reminder that simplicity is more than a passing fad, it can be used to achieve greater things. I'm reading Ron Blue's The New Master Your Money and he made a statement in his book that money is a great growth tool and test. I believe that statement flows with the article because when you have lived a life full of and centered on consumption (buying the latest, greatest, biggest, & shiniest), it can be a sign of maturity when you're willing to forgo those things and downsize for giving for God's purposes. 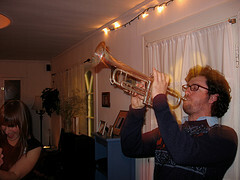 First of all let me say, nice trumpet. My husband is a college band director, I play clarinet and one of our sons is a trumpet player that just finished his master's at IU. Excellent post. I was just looking over some of our bills. We have said no to a new counter top at this time, needed money for car repairs and have older school phones. We are paring down possessions and services as contracts run out. We are thinking of less TV also. We send money to 3 Christian organizations but we should and want to send more.Please keep up the encouragement for those of us who struggle to keep the mentality of gotta have newer. Blessings. Thanks for leaving comments. I'm glad you enjoyed the post and received encouragement about simple living and giving. Blessings to you both!